Located in Julington Creek at Bartram Oaks Walk. 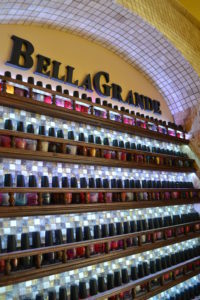 BellaGrande is a team of vibrant, friendly, chic professionals working together to exceed our client’s expectations. Each client deserves the friendly, exceptional services that we all seek. We offer a variety of high-end services at affordable prices. Experience the luxury of a warm, tranquil ambiance that will leave you rested and rejuvenated. We bring to you the most advanced sanitation methods. Our implement is sterilized in a FDA approved autoclave. We strive to bring you the best in the nail industry. Escape from your hectic week and relax with our rejuvenating nail services. We have full service waxing services for men and women as well as services for kids. We have over 10 nail stations and 14 pedicure stations with massaging chairs.